I came to Drexel University in 2005 after 20 wonderful years at Ohio State. While I still miss my colleagues (and the football) at Ohio State, Drexel offered wonderfully unique opportunities to contribute in new ways. In particular, I was able to found a Center for Corporate Governance. The primary missions of our Center are twofold: to enhance empirical research in corporate governance and to interact with the business community, being a think tank for the open exchange of ideas about best practices in corporate governance. The primary assets of our Center are a faculty committed to expanding the frontiers in corporate governance research and an advisory board of leading CEOs and directors. We host numerous activities during the year but our two signature events are our annual Academic Conference and our annual Director's Dialogue. I'll write separately about the academic conference. The Director's Dialogue is just that - a one dialogue between leading CEOs and directors, coming together to candidly discuss ways to enhance shareholder value. Raj Gupta, former CEO of Rohm and Hass was the keynote speaker the night before the conference. Raj talked about boards of the future. Raj led Rohm and Hass through wonderful years of growth and ultimately a very successful acquisition by Dow Chemicals. Bill McNabb, CEO of Vanguard, gave the luncheon keynote, talking about going global. Companies are returning to growth through acquisition. These panelists have years of m&A experience and understand the critical components of successful acquisitions and the red flags directors should be looking for whether their company is the acquirer or the acquired. Discussion Leader: michael Carr, Head of m&A, Americas, Goldman, Sachs & Co.
As companies look for global growth opportunities, they are faced with new organizational, operational, compliance, cultural and leadership challenges. These panelists will share their lessons learned from helping to grow global businesses and from their current perspectives as board members. 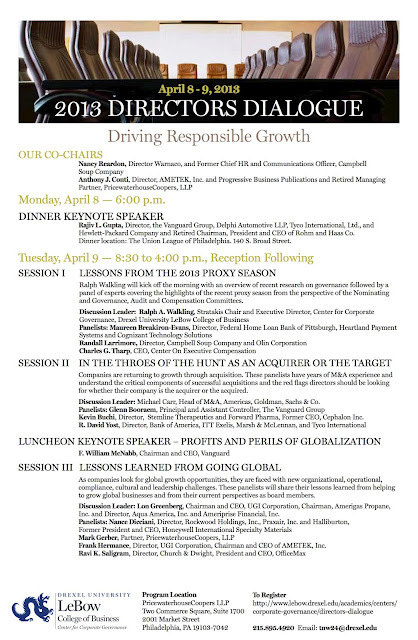 Discussion Leader: Lon Greenberg, Chairman and CEO, UGI Corporation, Chairman, Amerigas Propane, Inc. and Director, Aqua America, Inc. and Ameriprise financial, Inc. The complete program is below. I can't wait till next year's event.